Clearly my trainer love has become obvious because I was asked by the team over at JD Sports to pick a pair of my choice for the summer months. 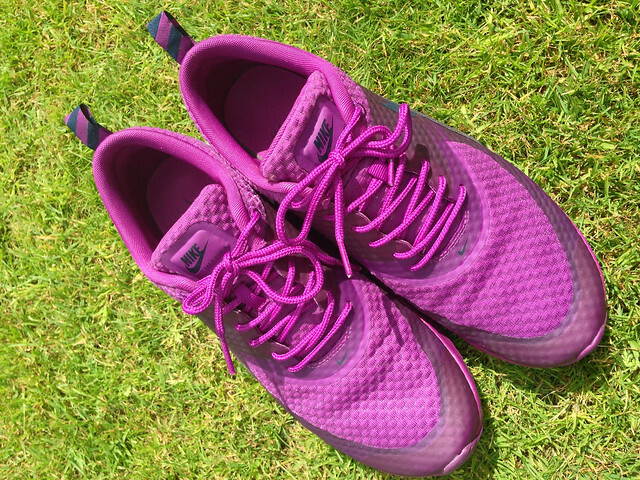 Which is so welcome because despite the fact that I've bought 4 pairs of trainers in the past 6 months, all of them are fashion ones - not suitable for actual exercise. So my brief for this was to find a pair that could work both as an exercise trainer AND a school run trainer. 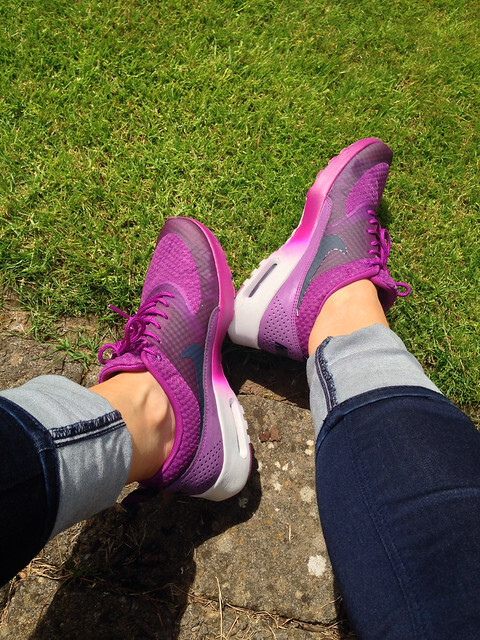 Meet the Nike Air Max Thea in Grape. 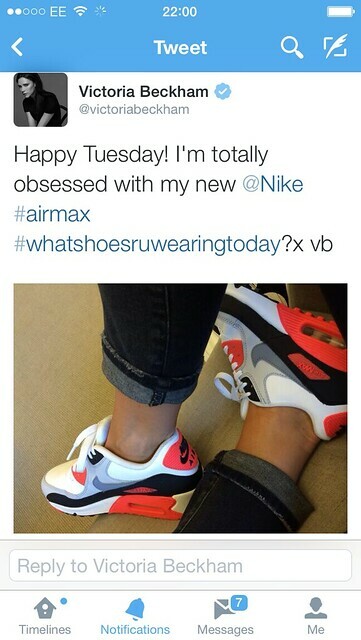 And can I point out that I'm not alone in my love of Nike Airs...a very similar style was worn this week by none other than style queen herself, Victoria Beckham! I got a size 7 (I'm a 6.5) as I'd read that they come up small but I don't agree with this - I felt I could have gotten away with the 6.5 had this colour way come in half sizes but with my trusty converse sports socks inside, they're perfect. 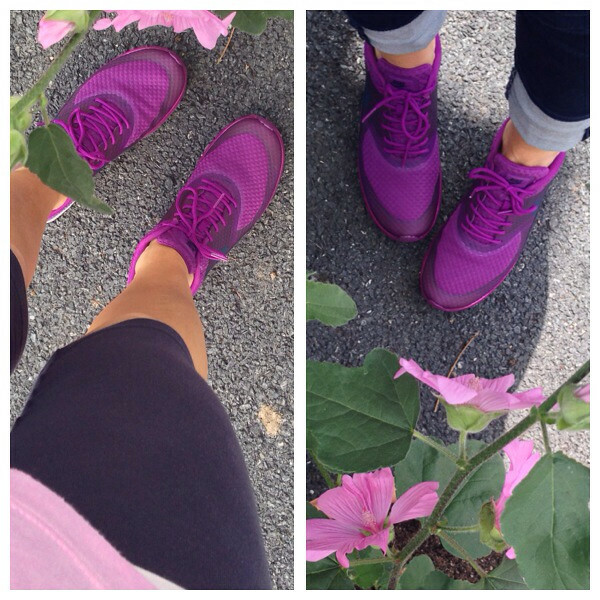 Other colour ways in the Thea do come in half sizes. Outfit wise, I'll not share the pilates class/long walk get up of knee length leggings, white vest and my Heaton's pink top. Did the job. For the school run I kept it simple with dark denim jeans and a white t-shirt. But I couldn't resist a bit of bling from the shop (Pink/Plum Necklace) as it matched perfectly! This particular style is available in 6 colours from JD Sports on this link. But if you preferred VB's - they're on this link...though not in the colour she has. Thank you to the team at JD for allowing me to finally, after 8 years, chuck out my Asics white gym trainers and get with the trendy gym bunnies with their coloured Nikes. Wow love the colour Avril, just stunning. Puts my muddy white running ones to shame!! 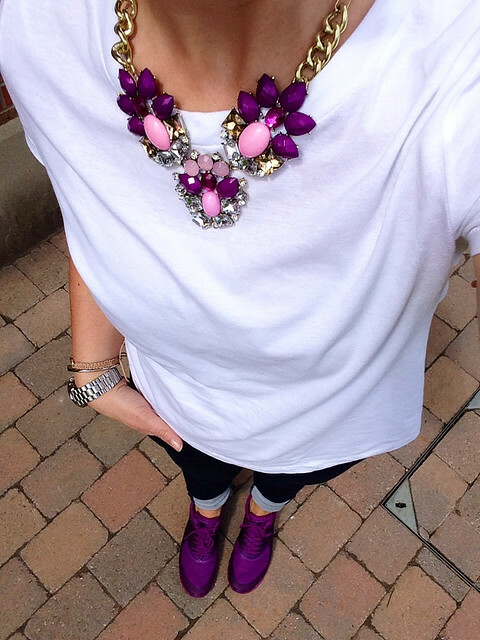 ADORE those trainers, the colour is AMAZING and teamed with your necklace the outfit looks fantastic! I am so nervous via instragam ... can't wait for the result! I'm an adidas girl for all my running togs but I LOVE that necklace! Purple is my favourite colour, I need to go take a proper look at it in the shop! Would love a pair of these and the colour is fab! Is the necklace a new one from your shop? Tempted!